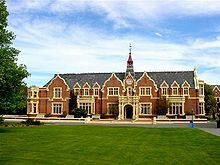 Lincoln University (Māori: Te Whare Wānaka o Aoraki) is a New Zealand university that was formed in 1990 when Lincoln College, Canterbury was made independent of the University of Canterbury. Its undergraduate study areas include agriculture, commerce, computing, engineering, environment, food, forestry, horticulture, hospitality, landscape, Māori planning, property, recreation, sciences, transport and winemaking. Lincoln University has a student population from more than 60 countries. Its primary campus is situated on 50 hectares (123 acres) of land located about 15 km (9 mi) outside the city of Christchurch in Lincoln, Canterbury. Lincoln University began life in 1878 as a School of Agriculture. From 1896 to 1961 it served students under the name Canterbury Agricultural College, and offered qualifications of the University of New Zealand until that institution's demise. From 1961 to 1990, it was known as Lincoln College, a constituent college of the University of Canterbury, until achieving autonomy in 1990 as Lincoln University. It is the oldest agricultural teaching institution in the Southern Hemisphere. It remains the smallest university in New Zealand and one of the 8 government universities. The University is a member of the Euroleague for Life Sciences. In March 2009, AgResearch announced that it planned to merge with Lincoln University, an idea that was later scaled back to "sharing of knowledge". On 18 November 2010, after a period of consultation, it was confirmed that a merger between Lincoln University and Telford Rural Polytechnic would go ahead, with the merger taking effect on 1 January 2011. On 18 June 2013, a new blue-print for the Selwyn campus was announced  which included the "Lincoln Hub" concept previously announced by the Government on 29 April 2013. Lincoln University Students' Association (LUSA) has been active on campus since 1919. LUSA acts as a representative for students on university policy, as well as providing advocacy services to students and running campus events such as the annual Garden Party and O-Week. LUSA is central in organising, supporting and funding the clubs on campus. These clubs include but are not limited to; Lincoln Soils Society, Tramping and Climbing Club, Wine Appreciation Club, LSD (Lincoln Snowboarding Department), Alpine Club, LEO (Lincoln Environmental Organisation), Food Appreciation Club, The Lincoln University Campus Choir, Bunch Rides (cycling), Lincoln University Rugby Club, Lincoln Malaysian Students Society (LMSS), International Rugby Club, SPACE (lesbian, gay, bisexual and transgender students on campus), Boxing Club, Young Farmers Club, and Lincoln Christian Fellowship. Lincoln University has six halls of residence, the oldest of which is Hudson Hall, built in 1953. Colombo Hall, Lowrie Hall and Stevens Hall all opened in 1970, with Centennial Hall opening in 1978, Lincoln University's centenary year. The newest hall of residence is Southland Hall, built in 1993. Faculty of Agribusiness and Commerce: accounting, business management, economics, farm management, finance, marketing and property studies. Faculty of Agriculture and Life Sciences: agronomy, plant science, crop physiology, pasture production, animal science, systems biology, computational modelling, food and wine science, entomology; plant pathology and crop protection; ecology, conservation and wildlife management; evolution, molecular genetics and biodiversity. Faculty of Environment, Society and Design: natural resources and complex systems engineering, environmental design, resource planning, transport studies, landscape architecture, Māori and indigenous planning and development, recreation management, social sciences, tourism, communication and exercise science. The New Zealand Tertiary Education Commission's first Performance Based Research Fund ranking exercise in 2003—equivalent to the United Kingdom's Research Assessment Exercise—ranked the quality of Lincoln University's research at sixth place. It also received highest percentage increase in research funding. For 2017/18 Lincoln's ranking is 319, released by Quacquarelli Symonds (QS) World University Rankings. Lincoln also has QS Five Stars rating. Lincoln ranks in the top 50 in the fields of Agriculture and Forestry (39th), and also Hospitality and Leisure Management (48th). Lincoln is ranked in the 401–500th bracket according to the 2017 Times Higher Education (THE) world university rankings. ^ "New-Chancellor-puts-Lincoln-University-at-forefront-of-tertiary-innovation". Lincoln University. 9 June 2017. ^ "AnnualReport2017". Lincoln University. 9 June 2017. ^ "Lincoln University International Student Information". Lincoln University. Retrieved 21 June 2010. ^ "Lincoln University profile". Lincoln University. Archived from the original on 25 June 2014. Retrieved 4 July 2007. ^ "Lincoln University - Supply Chain Management Education". Edumaritime.net. Retrieved 13 December 2018. ^ "AgResearch, Lincoln University merger planned". The New Zealand Herald. 10 March 2009. Retrieved 22 May 2015. ^ "Lincoln-Telford merger consultation document" (PDF). Lincoln University. 20 August 2010. Retrieved 22 May 2015. ^ "Lincoln-Telford media release" (PDF). 18 November 2010. Retrieved 22 May 2015. ^ "Lincoln University Selwyn Campus Master-Plan". Lincoln University. 18 June 2013. Retrieved 22 May 2015. ^ "Lincoln Uni global ′hub′ planned". Stuff.co.nz. 29 April 2013. Retrieved 22 May 2015. ^ Lincoln University Students' Association. "A Brief History of LUSA". Archived from the original on 27 March 2009. ^ "Clubs and Societies". Lincoln University Students' Association. Retrieved 8 February 2019. ^ "Agribusiness and Commerce". lincoln.ac.nz. Lincoln University. Retrieved 18 December 2015. ^ "Agriculture and Life Sciences". lincoln.ac.nz. Lincoln University. Retrieved 18 December 2015. ^ "Environmental Society and Design". lincoln.ac.nz. Lincoln University. Retrieved 18 December 2015. ^ "Lincoln University". QS World University Rankings. Quacquarelli Symonds. 2017. Retrieved 16 August 2017. ^ "Lincoln University". Times Higher Education. Retrieved 16 August 2017. ^ Gustafson 1986, p. 309. ^ Gustafson 1986, p. 330. Wikimedia Commons has media related to Lincoln University, New Zealand.